As soon as I heard about the mystery gull in Darwin, I wanted to see it. The authorities were debating its identity: some said it was a Caspian Gull, some said it was Heuglin's Gull, which (so I learnt) is a race of the Lesser Black-backed Gull. Whatever it was, it was a tick, and I wanted to see it. James Mustafa and I decided this was an opportunity too good to miss. We flew to Darwin on Monday, 16 January 2017, and arrived late at night, filled with expectation. I was confident we'd get this gull, even though it had not been seen for several days. Dawn was 6.30, so we set off at 6. We drove straight to Lee Point, where the gull had last been seen. 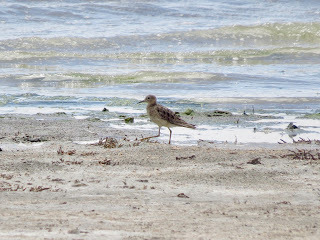 There were thousands of waders on the beach: mainly knots, also godwits and sand plovers, but also a few curlews and one Beach Stone Curlew. However, there were very few gulls. We expected our mystery gull to be associating with Silver Gulls so we were looking for flocks of gulls. 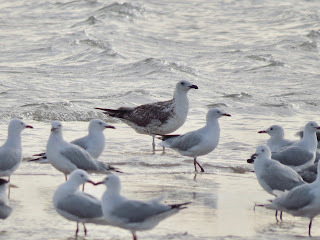 Every gull we saw was a Silver Gull, but they had no exotic companion. We walked along the beach, to ensure that we weren't missing any flock of gulls amongst the waders. Once we'd persuaded ourselves that our quarry was not present, we returned to the car and drove to Buffalo Creek, pausing along the way to check out a large flock of gulls flying overhead. They were all Silver Gulls. 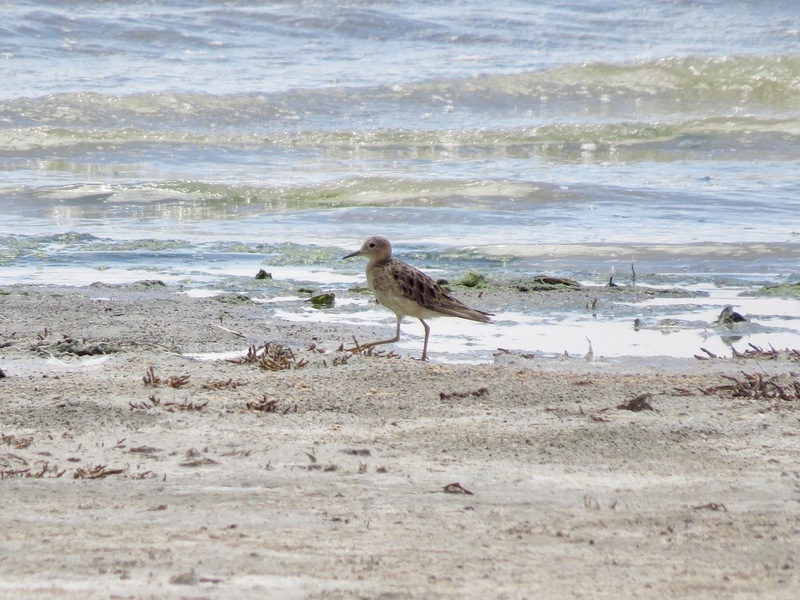 At Buffalo Creek, we could see a flock of waders and gulls on the sand spit. James jumped across the creek most elegantly. I walked up and down, looking for a spot where I could cross the water without either falling in or getting my feet covered in water up to the ankles. A greenshank regarded me with amusement. Once I'd finally crossed the creek (which was flowing quite quickly and was all of eight inches deep at the most) I had to climb a steep sand bank. I think James was watching the waders as I clambered awkwardly up the bank. I hope so anyway. I hurried to catch up with James. We walked towards the mixed flock, trying not to disturb some nearby terns. It was immediately apparent that one gull was much larger than the rest. There it was! We had our mystery gull at 7.37 a.m.! We felt disproportionately clever. All we'd done was walk along the beach and see a gull. We reacted as if we'd achieved some remarkable feat, and indeed that's how it felt. We congratulated each other with enthusiasm. Our plane didn't leave until 6.15 p.m., so we had a whole day to go birding in Darwin. We had a wonderful time, listing over 70 species for the day. We visited Knuckey's Lagoons, Snipe Pond, McMinn's Lagoon, East Point and, finally, a spot on the Esplanade looking for Barking Owls. Highlights were three Red-backed Button-quail at the Snipe Pond, and several Rose-crowned Fruit Doves and two Rainbow Pittas at East Point. This was a most enjoyable twitch. When the experts decide what to call this mystery gull, I will call it number 801. 2017 is starting off very well indeed. Yesterday, I saw a South Island Oystercatcher, which was my 800th Australian bird. Yippee! This has taken 26 years, as (although I've been birding all my life) I started twitching seriously in 1989. I know John Weigel can do it in 12 months (and I dips me lid to him) but for me, it took 26 years. I flew to Coolangatta (in Queensland) with my birding mate, Philip Jackson. We hired a car and drove to Broadwater in New South Wales, which took about an hour. At Broadwater, there was no obvious access to the beach. Other birders had referred to Broadwater Beach Road, but we could not find it. We went into the only handy shop in Broadwater, at the BP service station, spent some money to be polite, and asked about access to the beach. The friendly fellow behind the counter said he did not know (!) and summoned an assistant. She arrived, smiled, and confessed total ignorance. How could you live in Broadwater and not know how to get to the beach? The man then took pity on us, and said he thought we should drive past the power station and take the road to Evans Head. After a couple of kilometres, we should turn left, and that would take us to the beach. We followed his instructions. After a few minutes driving on the road to Evans Head, a road on the left was clearly signposted 'Broadwater Beach Road.' That was it. Other birders had talked about a picnic area, but we did not see such a thing. At the end of Broadwater Beach Road, we parked the car. There was a sign informing us that 'This reserve is a refuge for native animals' and, somewhat reassuringly, it featured an illustration of two oystercatchers. We took the track to the beach. No one had mentioned steep sand hills. It was getting warm as we arrived on the beach in full sun at 5 to 10. An Australian Pied Oystercatcher was foraging in the waves. Without hesitation, we turned left, that is to say, north. A few people were swimming, we could see some fishermen and three 4WDs driving along the beach. Some dogs barked on the cliffs above. Immediately we saw more oystercatchers. They were all long-legged. Our quarry, the New Zealand bird, has short, pinkish legs. It is a smaller bird and looks dumpy beside Australian Pied Oystercatchers. We walked on. Through our binoculars, we could see more oystercatchers in the distance. One certainly looked dumpy. After another five minutes walking, at 5 past 10, precisely ten minutes after we'd arrived on the beach, we saw our bird! Certainly smaller, with obviously shorter legs. Two of the Australian birds wore yellow flags on their legs. 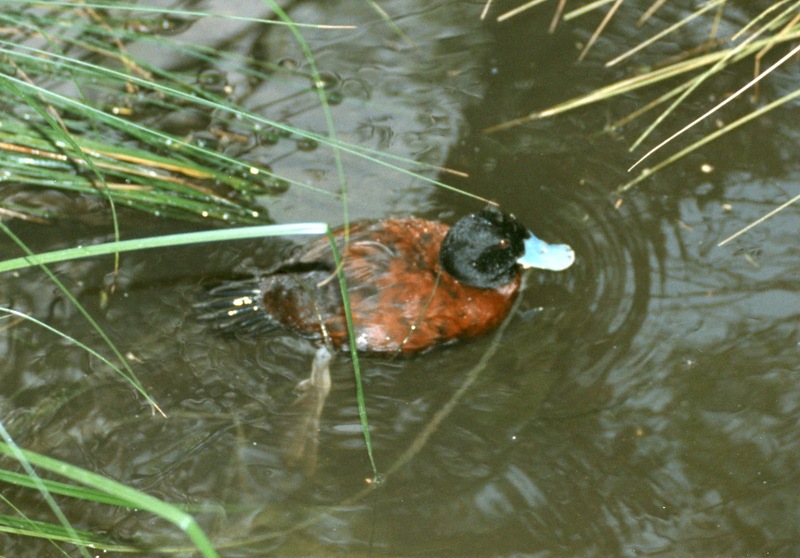 The New Zealand bird wore a red flag, but it was very high on his tibia, often covered by feathers. We were delighted. Sparkling pinot noir on the plane on the way home was nice, but bigger celebrations are definitely called for. Rog and I have been married for over forty years, and he still doesn't understand! 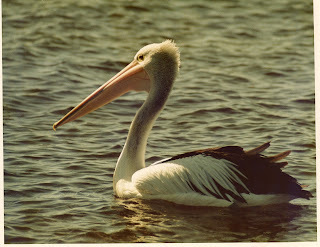 My birding mate, Philip, was back from his New Year's sojourn, and had suggested a trip to Werribee on Thursday. Of course I was up for it. Lots of other birders had taken advantage of the warm day too. There were people everywhere. 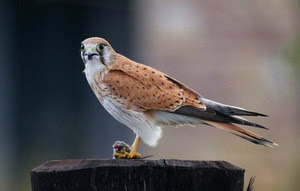 Philip and I had a great day and saw 16 species Rog and I had not seen on Sunday. Birds I was pleased to add to my annual list that I'd expected to see on Sunday (but hadn't) were: Hardhead, Blue-billed Duck, Cape Barren Goose, Whiskered Tern, Zebra Finch and Goldfinch. We saw three Hoary-headed Grebes, so at least I have one species of grebe on my list for 2017. We saw a flock of Dusky Woodswallows on the Point Wilson Road - birds that had chosen not to show themselves on Sunday. 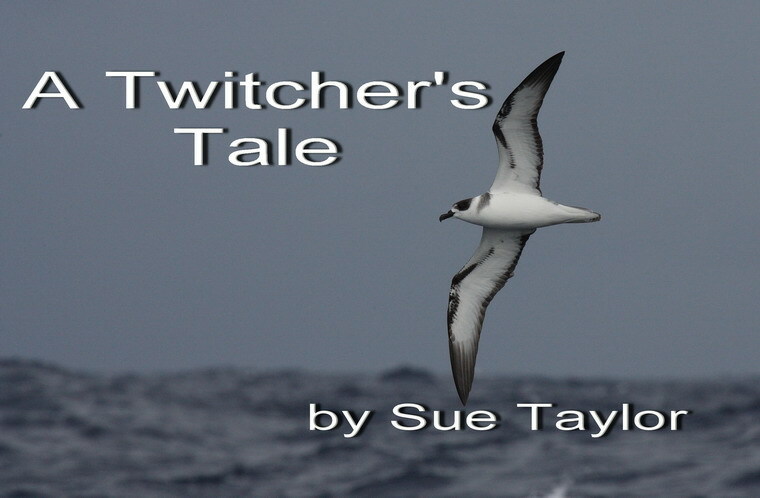 We saw two White-bellied Sea-Eagles, or perhaps the one bird twice - once sitting on a fence in the T-Section and one flying out to sea at the seaside bird hide. These were all welcome of course. But we also saw several good birds, birds I don't see on every summer visit to Werribee. These included the Red-necked Phalarope (swimming distinctively in front of us), Terek Sandpipers (yes, plural), a single Glossy Ibis (in T-Section), a couple of Horsfield's Bushlarks (sitting cooperatively still to be identified), one big obvious Red Knot amongst the stints and a lone Little Eagle (which I haven't seen at Werribee since autumn 2010). Philip and I did not see the friendly Buff-banded Rail that Rog and I had admired four days previously. And, although we saw both Striated Fieldwren and Little Grassbird, we did not enjoy the exceptionally good sightings Rog and I had had on Sunday. We saw Brolga, as Rog and I had on Sunday. But on Thursday, we saw two birds on four different occasions. How many individual Brolgas we saw, we will probably never know. The road to Kirk Point was closed. A sign informed us it is sceduled to re-open on 7 January. We were told the Pacific Golden Plovers had been seen the day before, but we couldn't drive in to confirm the sighting. Truly, a great day. Lots of wonderful sightings. I think I'd be happy going to Werribee every day. I started 2017 grumpy. I was forced out of bed half an hour early by Roger's stentorian snoring, only to be confronted by a large unfriendly spider that had taken up residence in the shower recess. I left home at 5 to 7. There was no traffic. I arrived at Leo's supermarket in Kew right on the dot of 7. Neither of the bread shops was open, but Leo's had a large sign in the window advertising the fact that it opened at 7. It wasn't open. The lights were on. The staff were inside, laughing and joking amongst themselves. I was outside and the doors were locked. The jocular staff could see me quite clearly. I left at ten past 7. The doors had not opened. 2017 could only improve from here. I'm pleased to say it did. My very favourite thing to do on New Year's Day is to go to Werribee. I'd visited in November and been struck by the small number of birds. Both waders and ducks were very poorly represented. I was interested to see whether things had improved. I'd heard there was a Terek Sandpiper present, and I thought he'd look good on my January list. Roger and I had a most enjoyable day, despite grey weather, and occasional drizzle. There were lots of teal and shelducks, and plenty of Red-necked Stints. We had some good sightings. Roger's favourite bird of the day was a Buff-banded Rail that stood on the road in front of the car on the river crossing and refused to run away. My favourite was a Striated Fieldwren on the road to Kirk Point, that sat beside the car and let me admire his beauty for several minutes. We flushed a Brown Quail on the Point Wilson Road. There were other good birds too. The Brolgas were present at the Borrow Pits. We saw both Little Grassbird and Australian Reed-Warblers at the former crake hot spot in the T-Section. However, there were no crakes. Or at least, we didn't see any. My list of omissions is as interesting as my list of birds seen. We saw no grebes at all. We saw no avocets. We saw no Pink-eared Ducks, no Hardheads, no Blue-bills. We saw very few raptors, very few cormorants and very few coots. I saw just two shovelers, and just one Whistling Kite. And I dipped on the Terek Sandpiper. However, I repeat, it was a most enjoyable day. As a friend of mine once quipped, there's no such thing as a bad day at Werribee.